My front yard farm is starting to look like a real garden! The beans, winter squash, and cucumbers are quickly climbing the tepee trellises I built. So far, my covert front yard vegetable garden looks like flowering vines and plants. Update 8/11/11 1:15 PM: Our Property Manager (AKA The Queen of No) told me she likes my yard and it looks very nice during her monthly drive by. She thought my rain barrel rock was a garden doodad - whew! It would be nice to see the flowering vines and plants when we sit on the porch at night though. 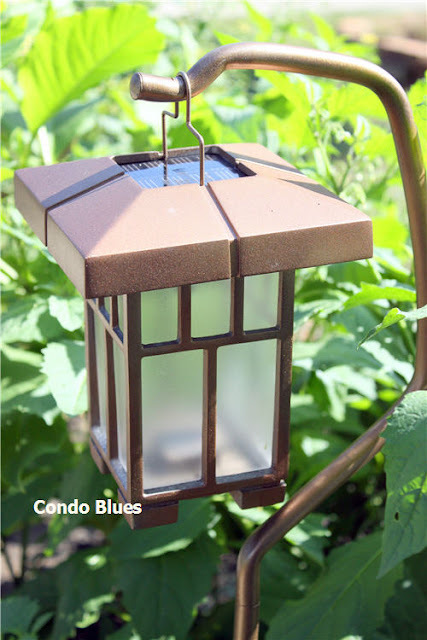 Once upon a time, my solar garden lights were copper until they faded into a hide in the garage color. On the bright side, I bought the orange flowers for $2.00 at the Restore. They were donated from a garden show. Woot! The lights sat in the garage while I looked and failed to find a similar set of new copper lights. Time to break out the spray paint! I had a can of Krylon metallic copper fade resistant paint in the garage. One can wouldn’t cover four lights and it's now discontinued - nuts. 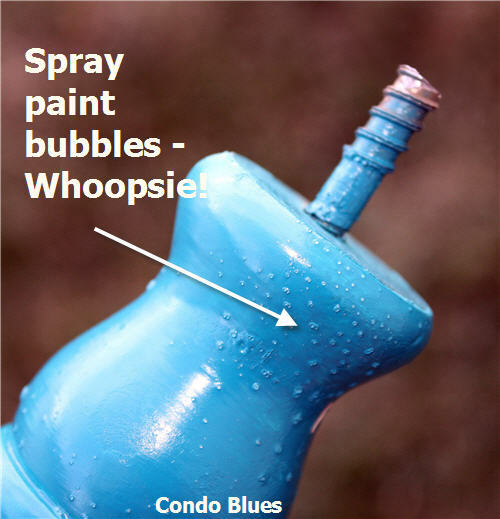 Fortunately, the green DIY mojo was with me because I found a new can of copper Rustoleum spray paint at the Restore for two bucks. I took the lamps apart and raided the recycling bin for raisers. Nice to know our vices come in handy for something other than, well, vice. Vitamin water is Husband's answer to avoiding sports drinks that contain high fructose corn syrup after a workout. The craft beer bottles speak for themselves. 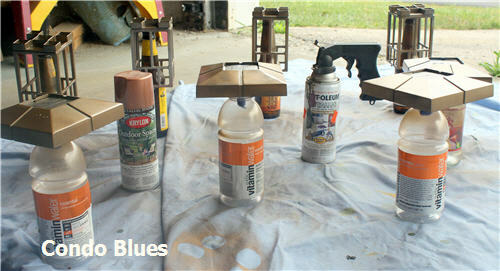 I used the lighter Rustoleum for the base coat and the darker copper Krylon for the top coat. 24 hours later – let there be garden lights! 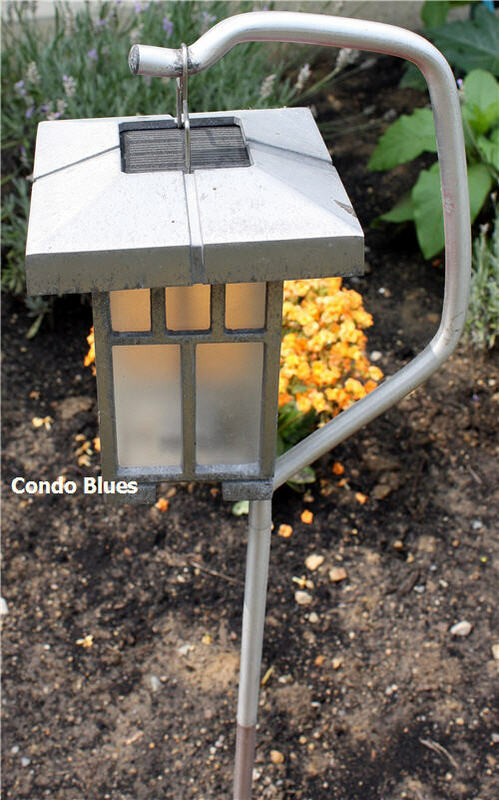 Oh my, the solar lights showed the taller plants could use some plant stakes. More spay paint to the rescue! I picked up some stair spindles at the Restore to use as plant stakes. Dowel rods would be cheaper but not as interesting. I want a prettier option since they live in the front yard. I gave the spindles a coat of the Rustoleum Lagoon spray paint I used on the tepee trellises and cut the screw end down a bit with the cutting wheel on my Dremel. I didn’t want to leave the top of the stake flat. 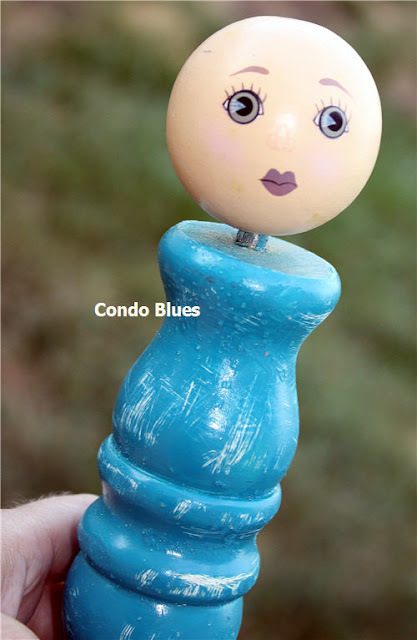 I found a wood doll head in my craft stash and screwed it on the little pudgy spindle guy. I considered leaving the head unpainted but didn’t. Husband wasn’t into an Addams Family garden theme. Besides, I screwed up and sprayed my first coat of paint to thick and too close to the spindle. That’s why I have air bubbles. I sanded the spindle again and gave everything a second coat of spray paint. 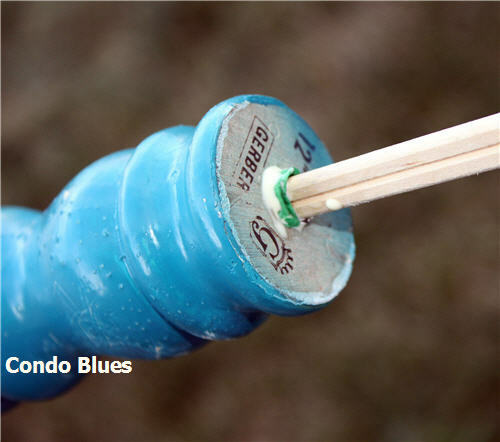 I used wood glue to glue a bamboo chopstick in the hole on the other end of the spindle. This will help keep the stake upright during crazy high wind thunderstorms. I tied the stake loosely to the plant for the photo so you can see my handy work. For the taller plants, I used taller and thinner spindles. I found unfinished wood cabinet knobs at the Restore and painted them Hunter Green (also left over from the trellis project) for interest. I cut the screw end down with my Dremel and screwed the knob to the top of the tall spindle plants stakes. I believe the Head Gardener approves. Now you know why I garden organically. 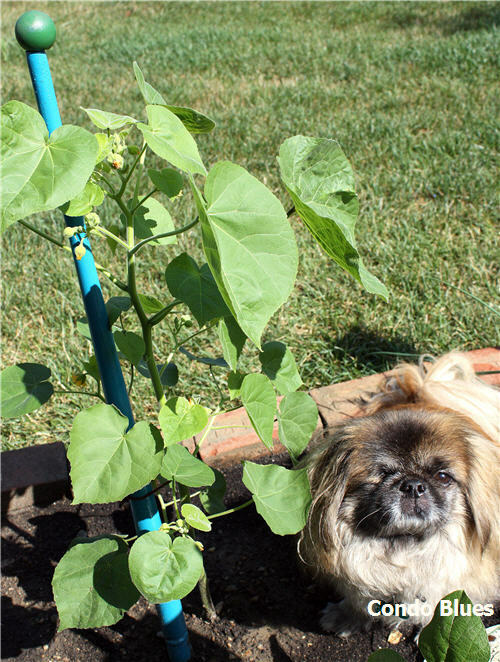 The garden beds are Blitzkrieg's favorite spot to sit in the sun in the yard. You're so resouceful! Blitzkrieg must be very proud of you and his fabulous garden.